Lambert House offers LGBTQ youth over 20 different programs, activities, resources, and services on an ongoing, year-round basis. Lambert House is open to lesbian, gay, bisexual, transgender, and questioning youth ages 11-22 for drop-in Monday through Friday from 4-9:30pm (see our calendar for holiday closures and breaks). The Lambert House drop-in center was cited as a model for best practices of drop-in for youth by the Washington State Board of Health in 2007. Lambert House closes for weather when Seattle Public Schools close. If Seattle Public Schools are on late-start, Lambert House will be open as normal. If Seattle Public Schools are on early dismissal or are closed all day, Lambert House will not open for drop-in or other programs - see our Facebook page for updates during inclement weather. New youth are asked to complete a one-time, 20-minute orientation on their first visit to our drop-in center. Orientation includes a demographic intake form (identifying information kept confidential, demographic data aggregated for reports to funders), overview of our House Rules, program calendar, and a tour of our youth spaces. Orientation is required before participation in most Lambert House activities with the exception of our large off-site events (i.e. Pink Prom, Halloween Dance, etc.). The Lambert House drop-in center is an open, comfy, cozy space where LGBTQ youth make friends and have fun. We have dozens of board games, a full-sized pool table, puzzles, video games, a piano, guitar, library, computer lab, and lots of other fun activities available. Youth receive informal mentoring through relationships built with adult volunteers and staff. More than 70 community members, after completing our thorough vetting and training program, facilitate community building and programs with youth. They (currently) range in age from 23 to 77, and represent a diverse array of careers, identities, personalities, and life experiences. Industries represented include hi-tech, medicine, social service, retail, management, corporate finance, project management, and much more! Drop-in Days, 6pm. Lambert House volunteers cook and serve dinner five nights a week for youth, volunteers, and staff. These meals serve as important community-building opportunities, and a source of healthy nutrition for those that may not have regular access. We ask our meals volunteers to provide a vegetarian option with each meal. "Lambert House has so many diverse programs and acitivites, there is always something that draws my interest and stimulates my mind." 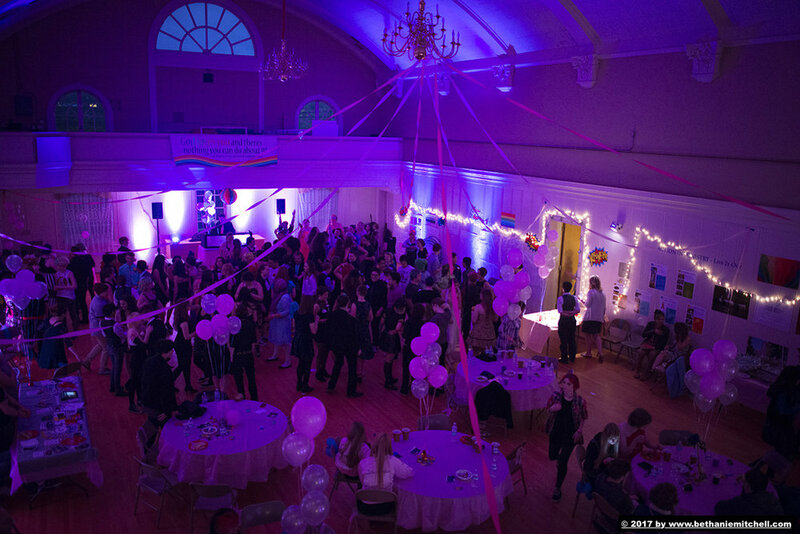 Each year, committees of Lambert House Youth Event Interns and volunteers plan dances and other large social events for LGBTQ youth. These typically include events for Valentine's Day, Pink Prom, Pride Weekend, and Halloween. Event attendance, depending on the event, can range from 50 to more than 200. These have included ASL lessons, bike repair workshops, activism training, field games, and more! Youth interested in volunteering to organize and create events/programs should talk with a staff member, or fill out our youth volunteer application. Come learn from fellow peers in all they have to offer. Get resources, ask questions, and read up on how to stay safe. A great topic for our support groups, peruse our resource table, or talk with any of the adult volunteers or staff. Lambert House also provides referral to free teen health clinics and testing centers. Enjoy and checkout many books and resources focused on the LGBTQ experience. Our library has over 3,000 books organized in topic-based sections including young adult, athletics, mystery, biographies, graphic novels, and more! Lambert House has up to 10 stipend-paid internship opportunities per year that are responsible for working on a team and planning large LGBTQ youth social events. Check out our Event Intern application for more information. Youth are a part of community building at Lambert House in a number of ways, including by volunteering! Youth volunteers help in a variety of ways including youth event planning, yard work, maintenance, office work, and more! Community service hours can be verified for school, too! Check out our youth volunteer application for more information. The CyberCenter has resources to support school projects, job applications, LGBTQ research, and personal connection. Our PCs have high-speed internet, software such as Microsoft Office and Adobe Creative Suite, printers, and headphones. The CyberCenter is chaperoned by volunteers who can assist youth with tasks including research, resumes, and applications. Lambert House thanks the David Bohnett Foundation for its support of our computer lab, the David Bohnett CyberCenter. Lambert House provides short-term case management for youth experiencing a variety of needs including housing instability, food insecurity, public transportation and identification, medical and mental health, searching for supportive faith communities, resources to give to parents, and more. With a variety of volunteers, including folks that work in counseling or social services, we can provide support and referral any day of the week for a variety of needs. Enjoy hiking and the healing power of the natural world. Lambert House provides a day-hike almost every month, typically with one camping trip each summer. See our calendar for this month's offering! Lambert House provides skilled hiking leaders, transportation from Lambert House to the hike and back. Tips and a list of supplies needed to be prepared are available before each hike, and Lambert House may be able to provide some items. (See our events calendar for this month's activity information) *Outdoor activities require a release form, signed by the youth if 18-22 or parent/guardian if 17 or younger. Lambert House takes advantage of donated tickets and youth ticket programs to go on field trips to Seattle Women's Chorus & Seattle Men's Chorus shows, plays & musicals, LGBTQ film showings, LGBTQ athletics, opera, art exhibits, museums, and other LGBTQ community events. Lambert House provides chaperoning and transportation for these events and requires that minors who are transported by Lambert House go back to Lambert House at the end of the field trip unless otherwise arranged in advance.